Though we're creeping toward Valentine's Day, this post is not about kissing. But it could involve your lips. I'm talking about lemons, Meyer lemons. 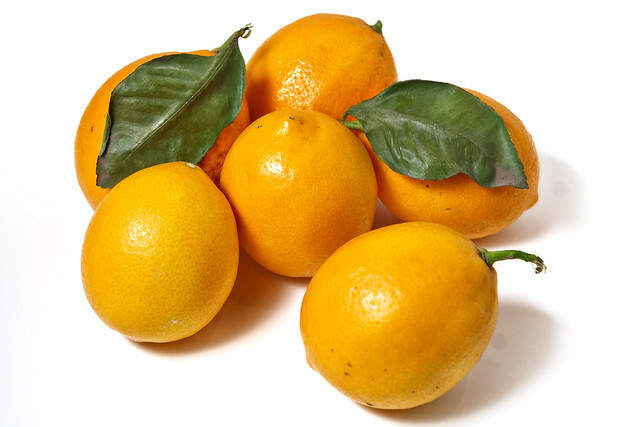 Widely grown all across California, Meyer lemons are thought to be a cross between a standard lemon and mandarin or orange. The plant originated in China and grew in popularity here in the states during the California cuisine revolution. They're juicy with an edible rind and none of that sourness of your traditional lemon. Have you used Meyer lemons? Is this the first you've heard of them? I love the juice and zest for a crumby lemon pound cake. Check out tomorrow's Sweet Basil & the Bee column in the Chico Enterprise-Record for some excellent ideas on how to preserve, chop, and incorporate this delectable fruit into your culinary arsenal. Here's my photo that will appear alongside that newspaper article. I love the sheen on the lemons and white backdrop!